Lloyd and Olwen Williams bid you a warm, personal welcome to Rowen Holiday Park. tree-lined meadow next to a small mountain stream, the Park is personally run and managed by the owners. They cater for families and couples and the Park is licensed for 35 units. Rowen is not "commercialised", but it has all the modern conveniences needed to ensure that your stay is both comfortable and hassle free - including a well stocked shop catering for everyday needs such as bread, milk and daily newspapers. There is also a launderette and public telephone kiosk. The beach, which is one of Wales' loveliest and cleanest, is reached via a path through farm fields and sand dunes and is approx. 800 metres away. 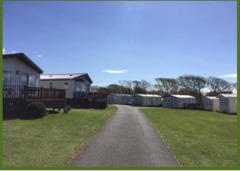 Quality assessors from "Visit Wales" (Wales Tourist Board) inspect the Park annually, and Rowen Holiday Parh is pleased to have retained the top 5 STAR award for yet another season.